Research since 2014, 100 years after the outbreak of WW1 on the 4th August 1914, has revealed the names of 315 Ossett men who lost their lives during WWI. Most of those men are remembered on one or more Ossett Memorials or Rolls of Honour, but 72 of the men, who were born or lived in Ossett, are not remembered on any Ossett Memorial or Roll of Honour. For this reason the ossett.net Ossett History website has created its own Roll of Honour as a tribute to all the 315 Ossett men who lost their lives in WWI: Ossett Fallen which can be downloaded and viewed by clicking on the link to the left. The second column of that database indicates upon which Ossett Memorial each man is remembered. The Memorial on which the man remembered is denoted in the Roll of Honour by its initials. 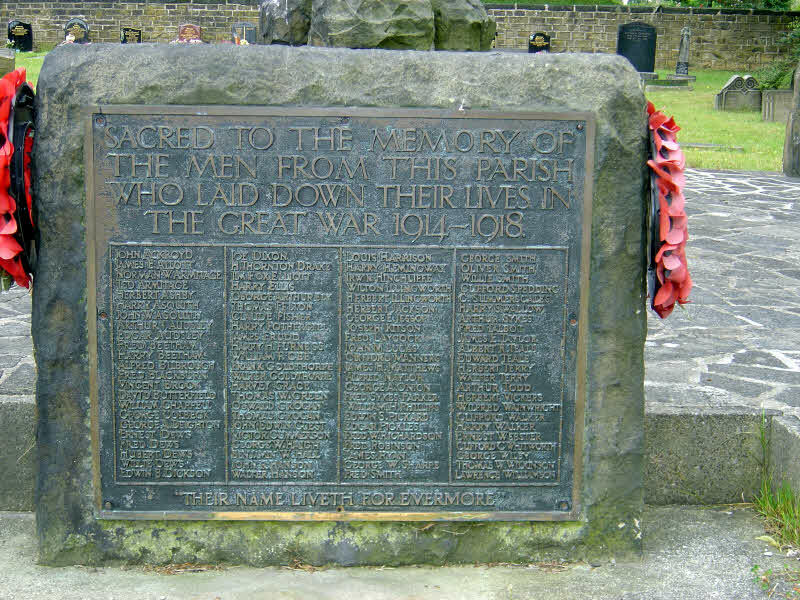 For example, Ossett War Memorial (OWM) or South Ossett Parish Memorial (SOWM) and a key at the end of the Roll of Honour records the total number of men remembered on each Memorial or Roll. A similar Roll of Honour for WWII has been created in respect of 87 servicemen and women, who were born or who lived in Ossett. This can be seen at this link Ossett WW2 Fallen. So far as we are able to tell, only Ossett Grammar School and Ossett Holy Trinity Church established a Roll of Honour for Ossett’s Fallen in WWII. St Mary’s Church Gawthorpe did propose a Roll of Honour, but it was never established. A list of the St. Mary’s congregation who died in WWII does survive. All in all, therefore, 402 men and women who were born and/or lived in Ossett lost their lives serving their country in WW1 and WWII. 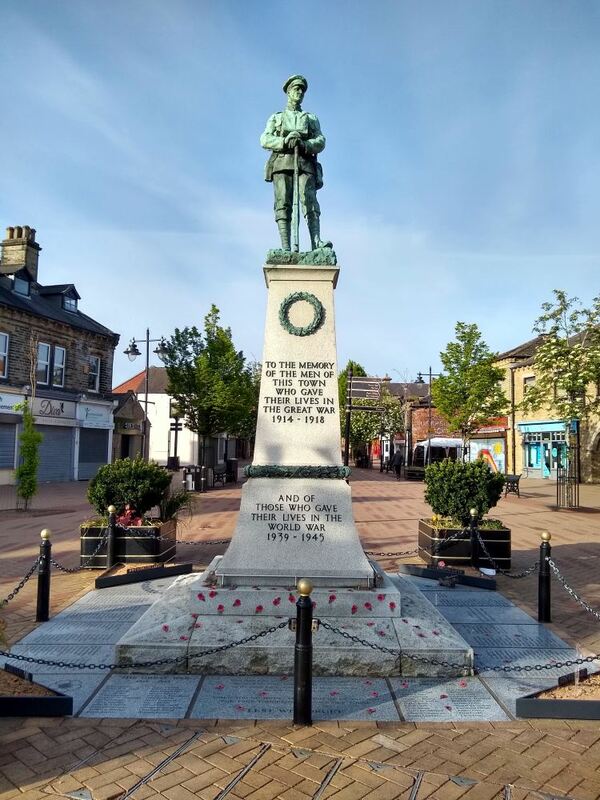 It is the intention, by the 11th November 2018, to engrave the names of these men and women on granite memorial stones laid at the base of the Grade II Listed War Memorial in Ossett Market Place. For the first time all of these brave men and women will be remembered by their names. Biographies for each of these men and women can be seen at the following links here: WWI and WWII. What follows is a full list and where possible an image of each of the Ossett Memorials and Rolls of Honour which were originally created by Ossett’s churches and organisations in respect of WWI, The Great War 1914-1918. Where appropriate reference is also made to those Rolls of Honour established in respect of those men and women of Ossett who lost their lives in WWII. Ossett’s War Memorial was unveiled on the 11th November 1928, exactly ten years after the WW1 Armistice was signed. The Ossett War Memorial was granted Grade II listed status on May 6th 1988. It is one of almost twenty Ossett Memorials, some in the form of Rolls of Honour, dedicated to the memory of those brave Ossett men who lost their lives. Some of the Rolls of Honour refer only to those who died but several record all of those who served with His Majesty’s Forces. Above: Ossett War Memorial, now located in the Market Place, was originally located at the bottom of Kingsway. In 1954 it was moved to a nearby location, also on Kingsway before being relocated to the Market Place in 2001. There are no names on the Memorial, perhaps because there were so many who had given their lives for King and Country. There were however 230 names listed in the programme for the dedication service of the Memorial, on the 28th November 1928. In addition a further 83 men have been identified. These men were born and/or lived in Ossett and died in WW1. In January 2018 a proposal was agreed by WMDC for granite Memorial Stones to be laid around the base of the War Memorial. Each of these granite memorial stones are to be engraved with tributes and the names of the Ossett men and women who lost their lives in WWI and WWII. More can be read about the Ossett War Memorial at this link: The Ossett War Memorial – The 100 Year Journey. Above: South Ossett Parish Memorial at Manor Road Burial Ground, Ossett. The Unveiling and Dedication ceremonies for the Memorial took place on Sunday, October 20th, 1922. The Memorial takes the form of a vast oak cross a symbol of Life laid down. The cross rises from a cairn of rough stones and is surrounded by a plot of green sward about eight yards square, protected by stone pillars and metal chains, with a stone tablet in the middle of the front. This tablet is shown above and contains the names of 92 Ossett men, including one man, Harry Beetham, who is not included on the Ossett War Memorial. Above: List of names on the South Ossett War Memorial, Manor Road, Ossett. South Ossett Parish also created a Roll of Honour which is in the possession of Ossett Library and, until recently (April 2016) displayed on the wall of the first floor meeting room at the Station Road location. The Roll of Honour shows the name, rank, regiment (and often the battalion), date of death and the address of the same 92 Ossett men. It also includes the name of one man, James Erly, who is not included on the above South Ossett Parish Memorial or the Ossett War Memorial. James is, however, included on the St. Ignatius Roman Catholic Church Roll of Honour. 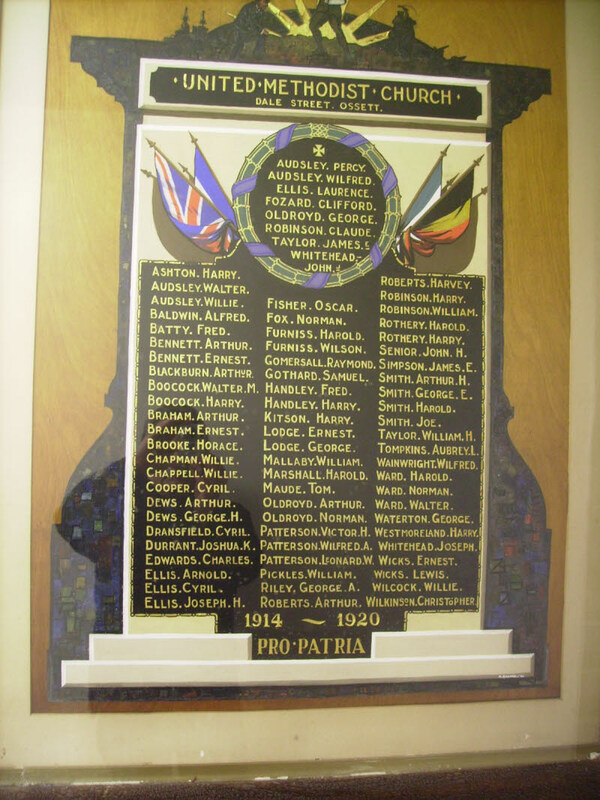 Above: The South Ossett WW1 Roll of Honour held by Ossett Library and currently in store. 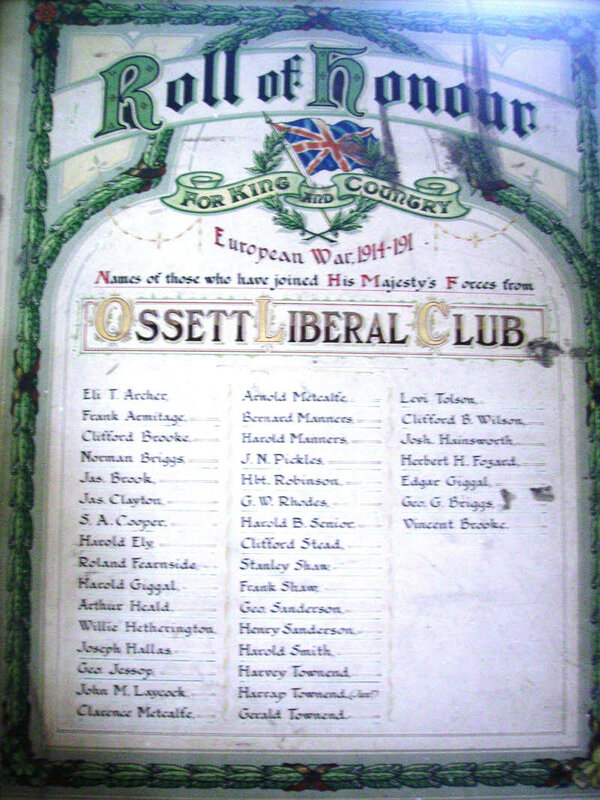 This Roll of Honour is located inside the Church and bears the names of 105 Ossett men, including one man, Willie Giggal, who is not included on the Ossett War Memorial (OWM). The Graveyard also has a Commonwealth War Graves Commission Headstone which commemorates 11 men who died, at home in the UK, in WW1 (and 9 who died in WWII). 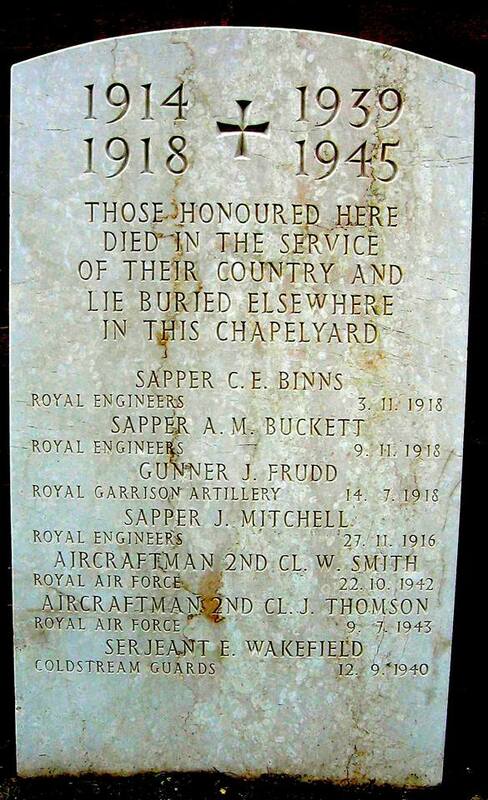 Two of those men remembered on this headstone, Harry Swallow and Irvin Hinchliffe, are not included on the Church Roll of Honour inside the Church. The full list of the men remembered here can also be seen on the ossett.net Roll of Honour. 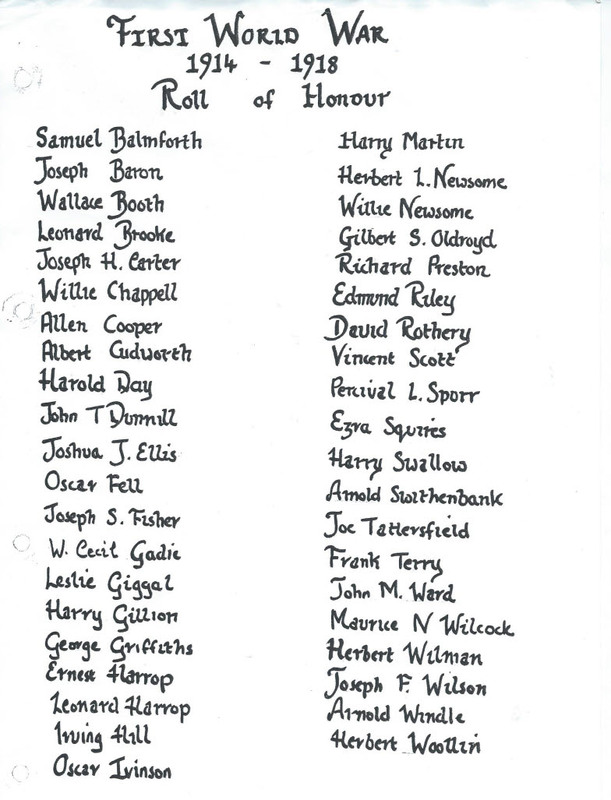 Above: Holy Trinity WW2 Rol lof Honour with a list of names. The Wesleyan Chapel on Chapel Street Ossett was built between 1866 and 1868 and demolished in 1961. No trace of the original Roll of Honour has been found, but it is known that it contained the names of 23 Ossett men who lost their lives in WW1. Three of these men, Clifford Ibbotson, Herbert Boocock and Bernard Clayton are not included on the Ossett War Memorial (OWM). 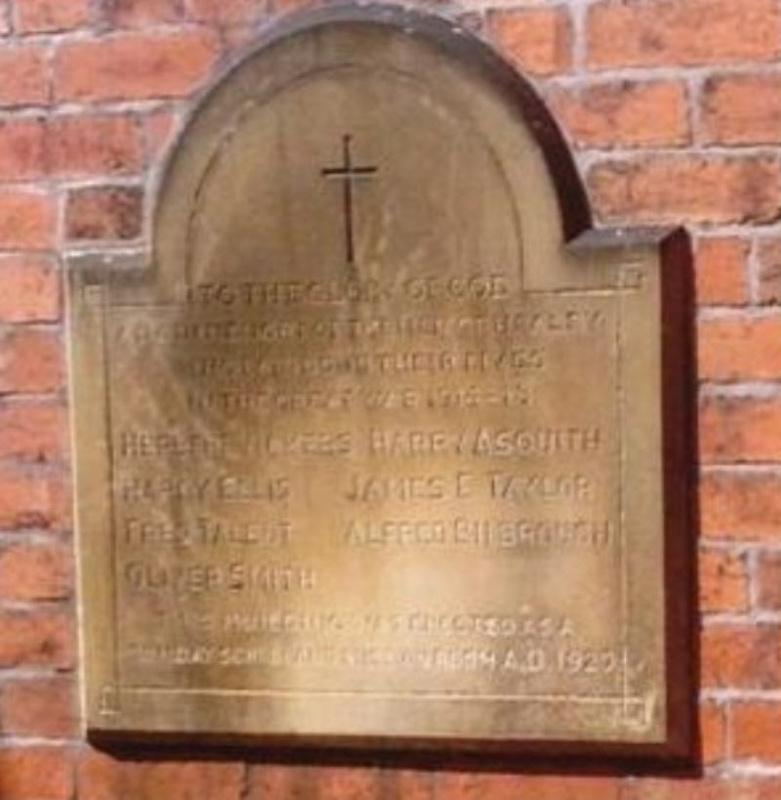 The Dedication and Unveiling of a War Memorial Window and Tablet (below) also of two private windows took place on Monday evening November 14th 1921. The Tablet, in alabaster and marble, was designed and executed by Messrs. W.H. Fraley & Sons Ltd Birmingham. The Ossett Congregational Chapel on The Green was the third chapel to be built on the site at the junction of The Green and Southdale Road. First built in 1883, the Chapel was demolished in 1973. 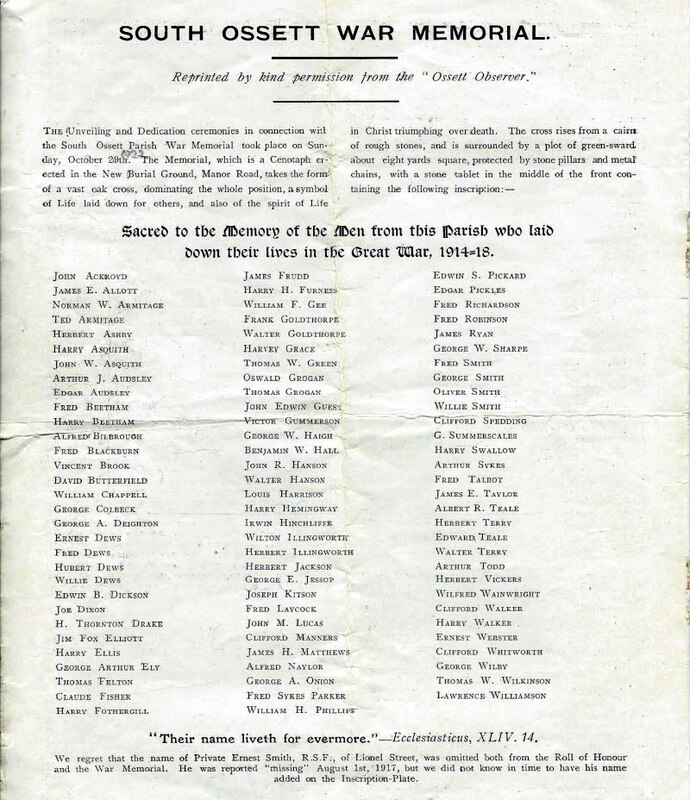 No trace of the original Roll of Honour has been found, but it is known that it contained the names of 15 Ossett men who lost their lives in WW1, including the name of one man, William Dews whose name is not included on the Ossett War Memorial (OWM). The full list of the Congregational Church’s men who died in WW1 can be seen on the ossett.net Roll of Honour. The Gawthorpe & Flushdyke Congregational Church, also known as Bethel Chapel, stood at the junction of the Wakefield/Dewsbury Road and Spring Mill Lane, Flushdyke. The Chapel was built in 1864 and was subsequently demolished. No trace of the original Roll of Honour has been found but it is known that it contained the names of 7 Ossett men who lost their lives in WW1, including the name of two men, Walter Chappel and William Midgely whose names are not included on the Ossett War Memorial (OWM). The full list of the Congregational Church’s men who died in WW1can be seen on the ossett.net Roll of Honour. The Ossett Central Baptist Church developed from Baptist Church at South Ossett and was built on Church Street by 1898. 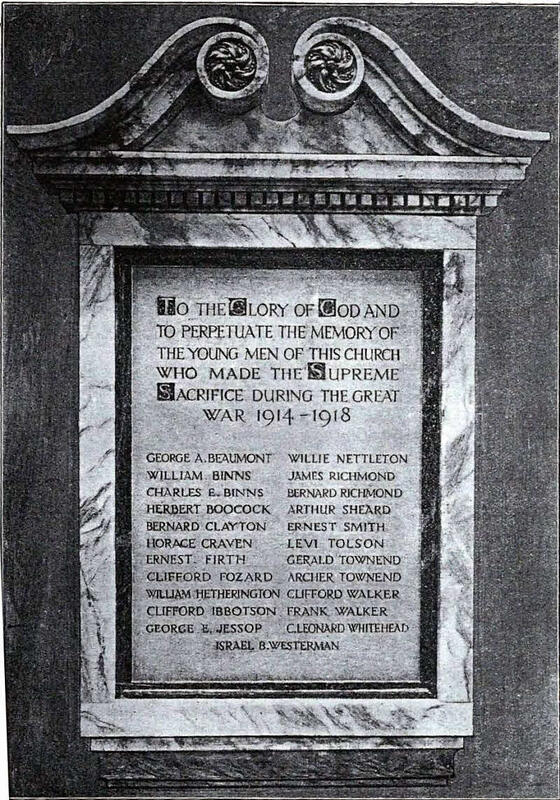 The Baptist Church had a Roll of Honour which contained the names of 14 men who died in WW1, including two men, Fred Ward and William Tomlinson not included on the Ossett War Memorial (OWM). The South Ossett First Baptist Church, the mother church for Ossett Baptists, was built on Baptist Lane, South Ossett in 1868 having replaced an earlier furnished barn which was rented for the purpose of worship. The Church was demolished in the 1970s. It is not known if the Church had a Roll of Honour but a Commonwealth War Graves Commission (CWGC) Memorial Headstone, containing the names of five Ossett men who died in WW1 (and three who died in WW2), was erected in the adjacent Burial Ground on Baptist Lane. One of those 5 men, Alfred Buckett, is not included on the Ossett War Memorial (OWM). When the Baptist Lane Burial Ground was desecrated in 2002, the headstone was replaced by the CWGC in the nearby St John’s Methodist Church on South Parade. This Memorial Headstone includes only 4 of those Ossett men; the fifth, Edgar Audsley, at the request of his family, is now remembered by a CWGC Headstone erected at Stonefell Cemetery, Harrogate. The reader can see more information about the Ossett Baptist churches by clicking the link. The United Methodist Church on Dale Street was built in 1857 and converted to apartments in the late 21st Century. 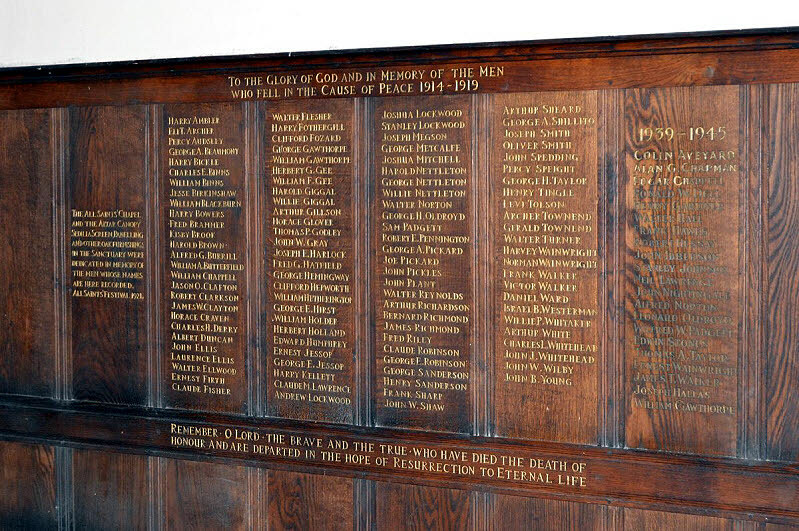 The UMC Roll of Honour includes the names of men of the UMC congregation who served in WW1. At the head of the Roll are the names of 8 men of the UMC congregation who were killed in the conflict. 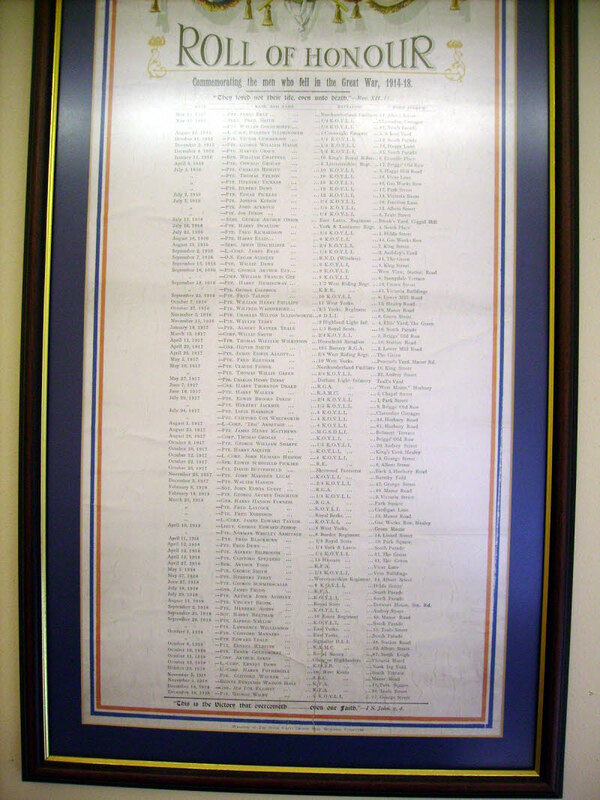 Above: The UMC Roll of Honour located in the War Memorial Community Centre, Prospect Road. 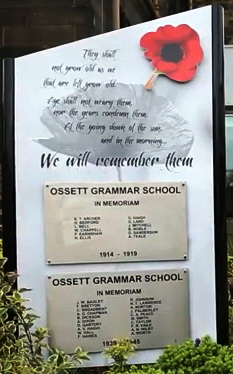 Great credit is due to Ossett Academy, formerly Ossett Grammar School for perpetuating the memories of those pupils of the school who died in WWI and WWII. The first School War Memorial was unveiled and dedicated on the 10th November, 1951, by the Lord Bishop of Wakefield. The memorial fund realised £280. 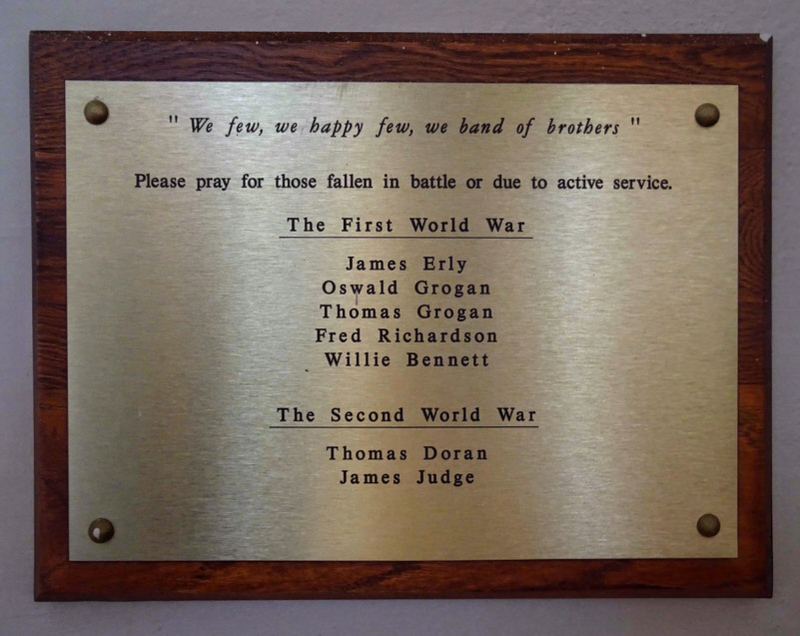 A grand piano was purchased and two bronze tablets, on which were inscribed the names of those members of the school who gave their lives in the two world wars, and these were placed in the Assembly Hall. Above: The two plaques dedicated to the Ossett Grammar School pupils who died in WW1 and WW2. The WWI Memorial honours 12 young men, all former pupils of the school who lost their lives. Seven of those men were born or lived in Ossett and five lived or were born in Horbury, Middlestown & Netherton. The WWII Memorial honours 20 young men, all former pupils who lost their lives. Ten of those men were born or lived in Ossett. 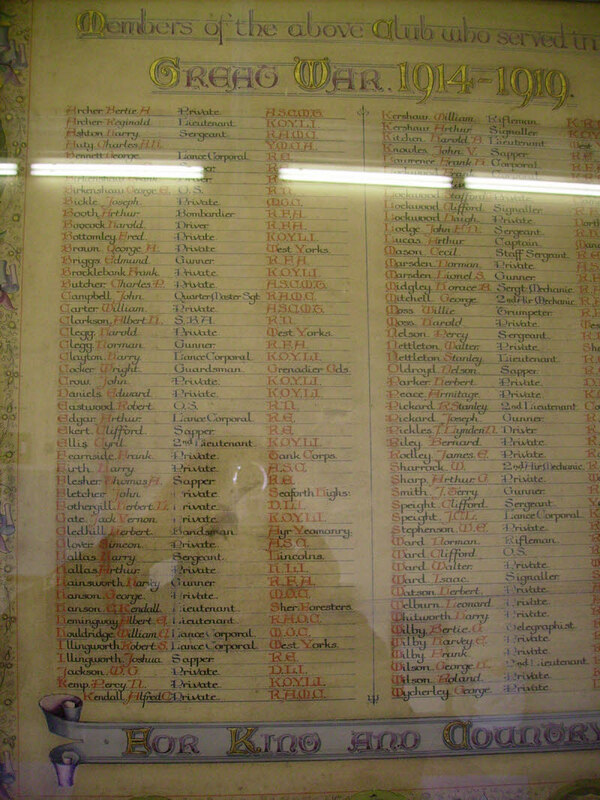 The Ossett Conservative Club Roll of Honour records the name rank and regiment of the members of the Club who served in WWI. The Roll once graced the walls of Ossett Library which until 2016 stood on Station Road, Ossett. The Roll is in the possession of the WMDC Library Service. Sunday School Sickness Societies were often established as Friendly Societies to provide financial benefits for their subscribing members in times when they may suffer illness which caused them to be unable to continue in employment. Benefit payments may also be made to the next of kin in circumstances where a member may have died. The following members of the Society died serving their country in WWI. Seven Healey men were recorded on the Mission Memorial, dedicated in 1920. A further three men (William Newsome, James Ryan and Clifford Spedding) who lost their lives in WWI and who were born, or lived, at Healey have also been located. It is likely that these three men were not included because the families had moved away from Healey sometime before 1914 and may not have been contactable by those people responsible for the composition of the names on the Mission Memorial. 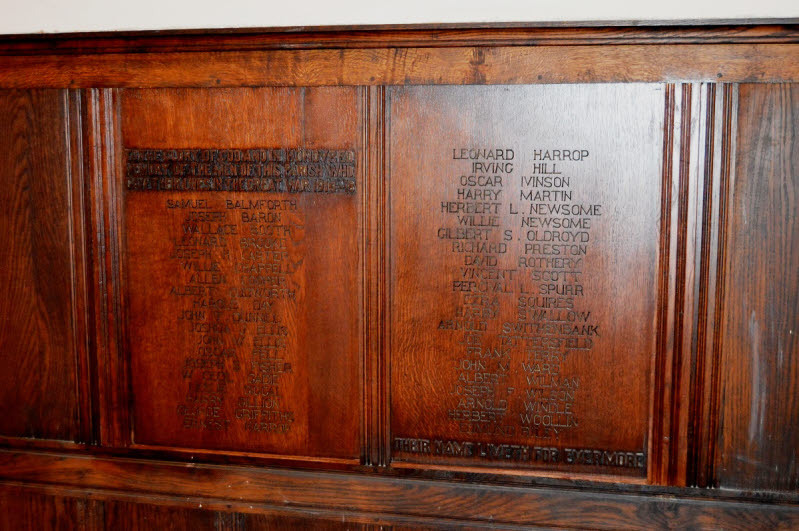 The Roll of Honour of the Liberal Club records the names of 39 Club members who served in WW1. Eleven of those men failed to return home. The Roll of Honour is currently (2018) in the possession of the Ossett Historical Society. 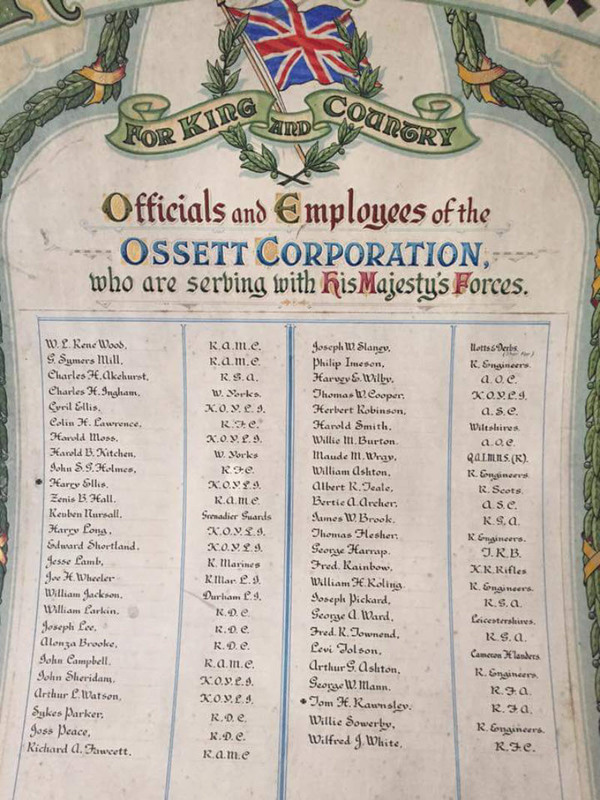 The Roll of Honour, which is now located in Ossett Town Hall, records the names of employees of Ossett Roundwood Collieries who served in the Great War 1914-1919. Many of the men were born and/or lived in Ossett but many were also from from beyond the Ossett boundary. The Roll of Honour includes photographs of many of the men who lost their lives in WW1. St Ignatius’ Catholic Parish in Ossett and Horbury is located on Storrs Hill Road, Ossett and is part of the Diocese of Leeds. A chapel was first opened in Ossett in December 1877 as a Jesuit mission from Wakefield. The Jesuits continued to run the parish until 1910 when Diocesan priests continued the work. The present church was opened in July 1933 and consecrated in 1978. The parish includes the towns of Ossett and Horbury, Horbury Bridge, and the villages of Middlestown, Netherton and Overton. The Memorial records the names of five men who fell in WWI. Four of those men were residents of Ossett and the fifth, Willie Bennett was from Horbury. The two men who lost their lives in WWII were both from Horbury. This Roll of Honour is currently (2018) in the possession of Ossett Town Hall. The rapid growth of population in Gawthorpe at the end of the 19th century led to the creation, in 1901, of a third parish in Ossett. it was technically designated a "consolidated chapelry", bearing the name Gawthorpe with Chickenley Heath, combining portions taken from the older parishes of Ossett, Earlsheaton and Hanging Heaton. The church of Gawthorpe St Mary the Virgin was built in 1899 to serve the new parish. Gawthorpe St. Mary's Church was located close to the western boundary of Ossett, between Chickenley Heath and Ossett Streetside. The church closed in 2001, largely because of diminishing congregations and a new road layout making access difficult for pedestrians. The Gawthorpe parishioners were transferred to Holy Trinity Church, Ossett, whilst Chickenley parishioners were transferred to a new church in Dewsbury. In 2007 planning permission was granted to convert the old church into a modern apartment block, but because of the state of the housing market at the time, this was deferred and the church stood empty for four more years. The fine old church, complete with the organ was eventually demolished in January 2011 to make way for residential housing. 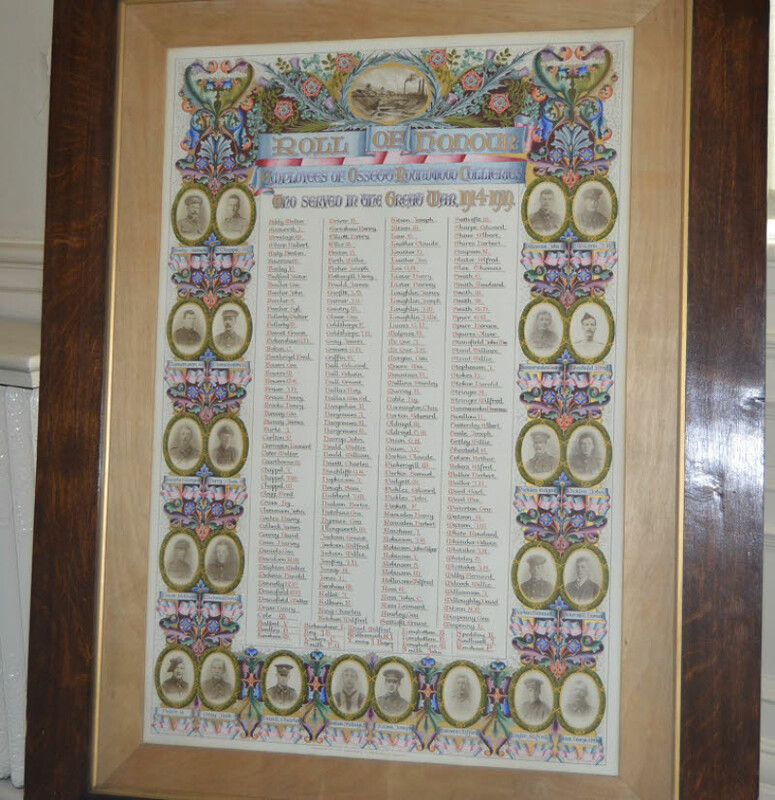 The Church’s Roll of Honour was rescued before the demolition and is now positioned in Ossett Holy Trinity Church. The Roll of Honour for those men who fell in WWI is shown below.